High quality, high definition mobile videoconferencing available wherever you need it. Recently, Lake Cook Reporting began offering a new kind of mobile videoconferencing service that seeks to bridge the gap between traditional video conferencing and consumer-grade mobile products like Skype and FaceTime that’s available to setup in any office, courtroom, meeting space, hospital, and more. Multipoint connections with multiple room systems (Polycom, Lifesize, etc.) as well as personal computers, Macs, tablets, smartphones, audio-only telephones, and more. Fast and stable internet-based videoconference connection available anywhere with a cellular signal. High definition picture streamed at 1080p and high quality sound on any TV or monitor. Sharing of documents, computer screens, annotations, iPhone/iPad displays via AirPlay Mirroring, and more. MP4 recordings of the deposition. Time and money saved avoiding the hassle of travel. An example mobile video conference at our offices at Lake Cook Reporting. 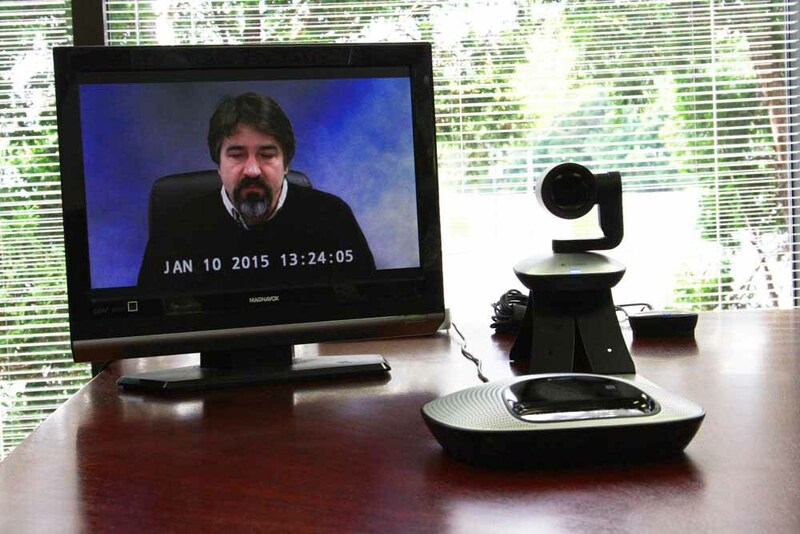 As streaming video technology continues to improve, attorneys have increasingly relied on videoconferencing during depositions and trials to save time and money. 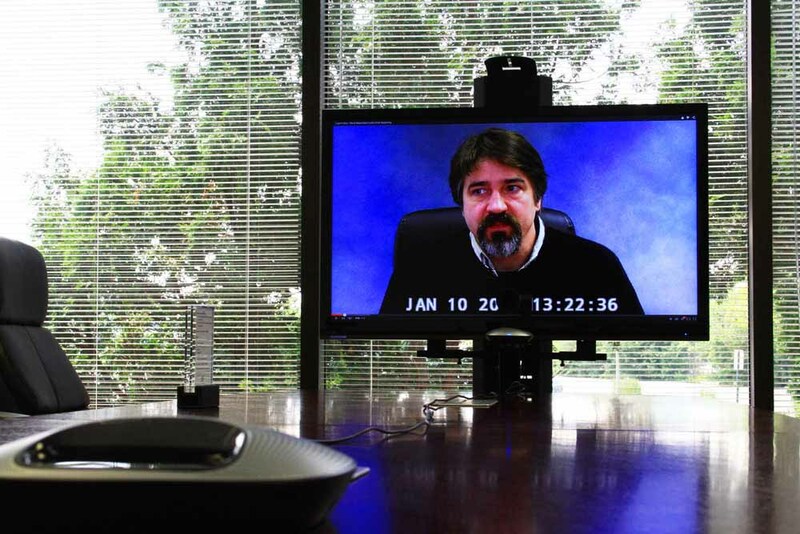 Traditionally, videoconferencing required attorneys to host their meetings in video conferencing centers or court reporting firms where they can connect to other participants. But, what if the nearest center is too far for you or your witness to travel? 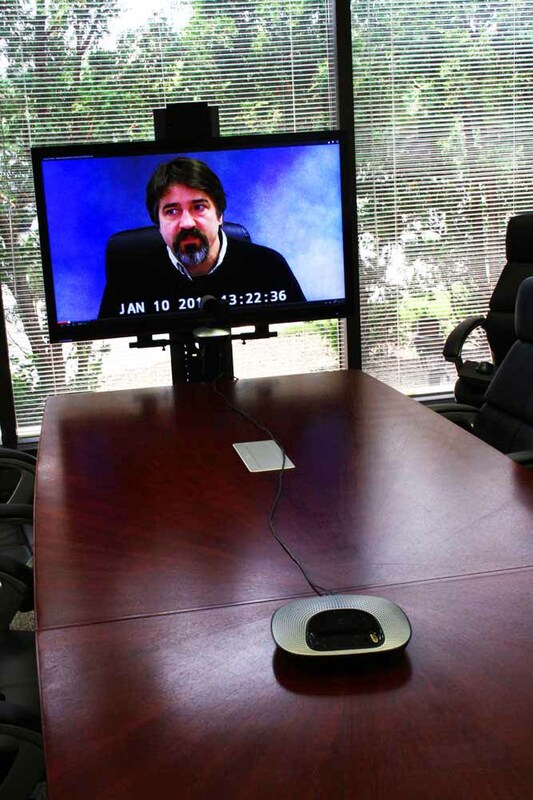 What if you want the deposition held in your office but don’t want to invest thousands of dollars in a video conference system? What if the witness is confined at home or at a hospital and can’t travel? What if you want to broadcast the witness to a jury during a trial and the courtroom lacks videoconferencing equipment? While low-cost and low-quality options like Skype seemed like the only option for many, we wanted to combine the convenience of Skype with the excellent audio and video quality offered by traditional video conferencing systems. Our solution includes the mobility to setup anywhere while ditching low-quality webcams in favor of high definition cameras and omnidirectional table microphones. Our portable 1080p camera and microphone/speakerphone combo offered with our mobile videoconferencing provides an excellent picture and high quality sound without requiring a full room system. Beyond quality, our system features universal compatibility with what devices it can connect to. Lake Cook Reporting’s mobile videoconferencing equipment works on PCs and Macs and requires only one USB port, allowing our system to work with our devices or your existing computer. We also combine capability with flexibility by simplifying the setup and connection process. Rent equipment from us or use your own TV/monitor, computer, etc.. Along with providing high quality conferencing, we utilize software that allows us to bridge between computers, tablets, telephones, and video conference room systems like Polycom, Lifesize, Tandberg, and more. Our system is also compatible with Skype, Cisco WebEx, FaceTime, and any other PC/Mac software, allowing us to truly bridge the gap between computers and video conferencing systems. Looking to host a conference at a place without a reliable internet connection? We can bring an internet connection to you. By utilizing a fast and reliable cellular LTE connection, we can bring internet access to just about anywhere. With our cellular connection, we’ve previously streamed in via videoconference an expert witness for a trial in a courtroom by providing both mobile videoconferencing equipment and internet access. Contact us today for your mobile videoconferencing needs. We’ll provide a solution for any issue, anywhere, any time. Our unit can be used with any PC, laptop, Mac, etc. with a USB port. The computer can then be plugged into any size display to show a picture. Located north of the I-94/I-294 merger just minutes away from Chicago O’Hare Airport. Located in the Chicago Loop near the Monroe CTA Blue Line station a few blocks away from the Daley Center. © Copyright 2019 | Lake Cook Reporting, Ltd. | Phone: (847) 236-0773 | All Rights Reserved.